1. Anything from the Zoella range - everything looks so cute and lovely. 2. I really need a new perfume and have been lusting over this Daisy Dream by Marc Jacobs. 3. I have read so many reviews about Nars Sheer Glow Foundation, I would love to be treated to some of this. 4. I love this PJ set from Next, I think it would be so nice to wake up to these on Christmas morning. 5. Soap and Glory is such a staple and I've actually already bought this set for my boyfriend to give me on Christmas Day! 6. 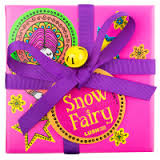 I saw this Lush Snow Fairy gift box ages ago and have been hinting like mad over the last few weeks - fingers crossed! 7. This Keepsakes Red Lip Bag by Mac is such a bargain and such a lovely set. I have been dying to try some of Topshop's make up range for so long now, I know I know, I'm terrible for not buying something sooner! I was instantly drawn to their cream blushers and moisturising lipsticks but just never seemed to get around to actually purchasing either. So, when I saw that they had brought out this little duo for Christmas, and at a wonderfully low price of £12, I could resist the urge no longer! There are two different sets to choose from and I opted for the deep purple berry lipstick named Wicked, and the bright peachy coral blusher called Head Over Heels. I am so happy with my purchase, I absolutely love the packaging and know that both of these products will feature heavily in my winter/Christmas make up! I also picked up some cute little bracelets which were on sale for only £2, Topshop always do a great jewellery sale! Do you like what I bought? Have you picked up any great bargains in Topshop lately?